Hey Everyone! Thanks for stopping by again. I am glad to be back to share another card with you! I hope that you aren't getting bored of seeing Thank You Cards, as there are going to be some more coming up over the next couple days because like I've mentioned before I am working my way through a couple card orders and some of the cards are thank you cards. 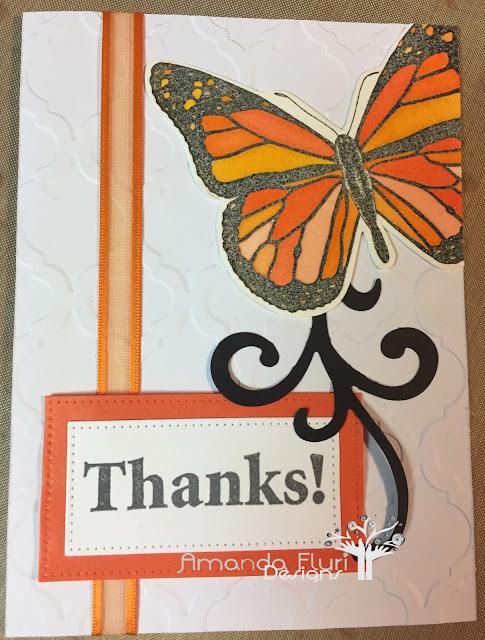 I am making multiples of the cards that you are seeing, and keeping a couple in my stash, because lets be honest, one can never have enough Thank You Cards on hand! Again for this card I used oranges, and yellows and blacks. All of which are colours that I don't usually use together, so I thought that I would step outside the box and try something a little bit different! I hope that you enjoy this card...its super simple, but I wanted to keep the focus on the Butterfly! Black Cardstock - used to cut out the flourish on the front of the card. Thanks again for stopping by! If you have any comments or questions, please leave them below! I promise to be again really soon with another card!